Sunday Morning Small Group and Traditional Sunday School Bible Study is at 9:30AM. We offer age appropriate study groups for the whole family. For adults we offer several learning groups*: from lecture style – to interactive, senior adult groups – to in-depth theological studies – as well as topical studies with our Pastor. Come and find the place to learn and grow. Sunday Evenings – Our programs vary. Check our calendar tab to see what is planned on any given Sunday evening. Our activities vary and include: Youth Fellowships; Regular Business Meetings; Pastor, Elder, or Deacon led discipleship is available by pre-arrangement. Thanks to all who have participated in our Financial Peace University courses. If you missed our most recent sessions, or just want to refresh their skills & renew your financial commitments, we will launch another FPU group / session soon. New course registrations will be announced here, on our social media and at the Connect Center. Discipleship: is in our DNA! Now in the 5th generation of discipleship, we have many individuals ready to lead others into a life style of discipleship! Sign up at the Connect Center, or by using your connect card, if you would like to be involved in one on one or Small Group discipleship or studies. We use the Foundations material, as well as some additional studies, that include the basic precepts of Christianity. While it may be elementary to you, the goal is for you to not only KNOW the material yourself, but also to be able to teach it to a non-believer….something few of us are prepared to do. There are many other opportunities for you to go deeper with God through our study ministries. Let us know how to help you connect! Interested in servant leadership? Training for our service and care ministries is available with our deacon ministry. See John Higginbotham or Pastor Jeffrey to inquire about this opportunity of service. We have a growing need for ministry to young adults, both single and married couples. We are praying for God to provide leaders for this ministry. Note your connect card if you are interested in connecting with others in the age group. – Our team of leaders gather the ladies regularly to pray, plan, and prepare for ministry. There are many projects underway, so visit the connect center for more information on Bible Study, prayer meeting, fellowship, and missions projects. – Seeking Leaders to assist Jeff Vandaveer in championing this ministry. Maybe you can’t “do it all” but want to be part of our leadership team – there’s a place for you! Contact the church office, or Jeff V, to get more details. – Small Group Discipleship & Activities – Vary from Camping Weekends, to NASCAR, to p rayer groups. We currently have a group meeting regularly to study God’s word and how to follow Christ in an anti-Christian world. 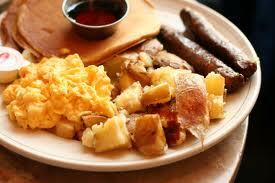 – Our men meet monthly for the “Men On Fire” breakfast. This is a cross-denominational group of men who meet for worship, prayer, and study at the Golden Corral located on Dysart – just south of the I-10. We meet on the first Saturday at each month at 8am. – Monthly Tuesday Luncheon – The seniors meet the second Tuesday of each month at Noon for a time of fellowship. * This event is on summer break as many of our Seniors retire to cooler climates – see you back in the Fall! – Bible Giveaways. Our Senior Adults pool resources to assure each new member is presented with a Bible at the time of their baptism. Please contact the church office, or the Senior Adult Sunday School class, to connect with this opportunity. – Specialty & Topical Studies are offered on a rotation basis. Contact the Church Office for more information. – Small Group – Off Campus, times and locations vary. What is the New Comers Class? Whether you have been coming to FBCGL a while but have never connected with others, or are brand new to FBCGL, this is a “get to know you” class. We hope to help you build relationships with church leaders and with other believers through a simple study series that reinforces some of our basic beliefs, gives you some church history, and shares our church mission and ministries. 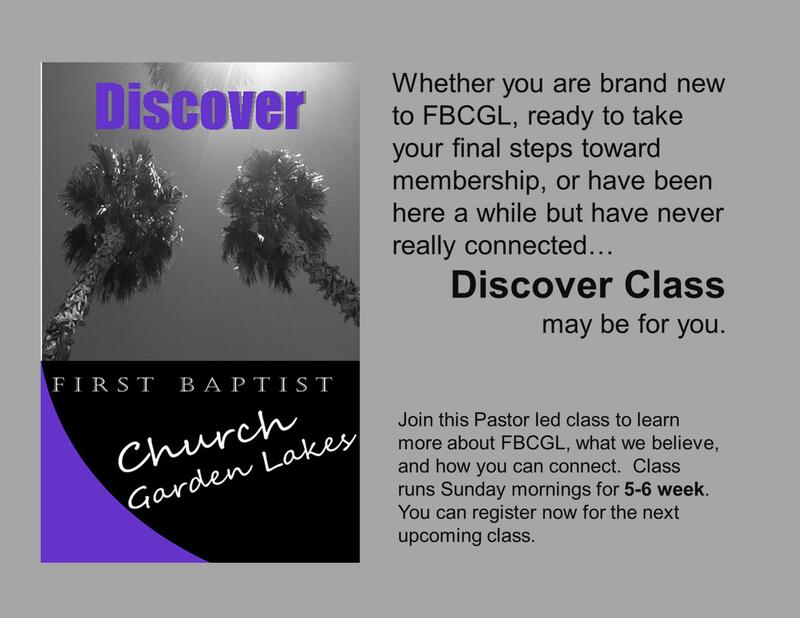 You will gain a clear understanding of the pathways to church membership at FBCGL. Pre-Register for this class through the church office or at the connect center, or on your connect card. We will gather for a lunch fellowship after the service and eat together. Then we will have a two hour class through the afternoon. – His Needs, Her Needs – Biblical Marriage. This is a small group course offered on a rotation basis. Because the course is “building blocks” based, participants are asked to commit to the full 8 week course of study and the group is kept to a limited number of couples. Please visit the connect center, or call the church office, to register for the next class. This is for couples soon to be married, newly married, or just wanting to improve their marriage with God’s help! Baptism Class. Learn more about following Christ’s example of baptism. If you are recently saved – or maybe a long time believer – new to the Baptist faith – this class will share with you God’s word regarding baptism and what we as Baptists believe. All the “Who, What, When, Where, Why and How?” questions will be answered. And, if you decide to follow Christ in baptism – we will help you pick a day, answer any questions you have, and give you information to share with your family and friends who may want to celebrate with you. We conduct a group class when warranted, or you may go through this study one on one with one of our church leaders.